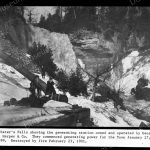 Item consists of a black and white photographic copy negative depicting Webster's Falls and the view of the generating station owned and operated by George H. Harper & Co. It was destroyed by fire on February 23, 1901. 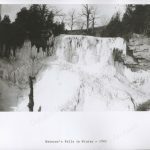 Item consists of a black and white photographic copy print depicting Webster's Falls in Winter 1900. Item consists of a black and white snapshot with scalloped edges, depicting Webster's Falls. 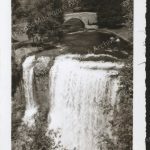 Item consists of a black and white snapshot with scalloped edges depicting a commemorative plaque with "Webster's Falls; The Late Lt. Col. W.E.S. Knowles, 1862-1931. 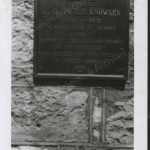 A Native Son of Dundas and Lover of the Out-of-Doors by His Generosity Made Possible the Beautification of these Grounds, 1938." 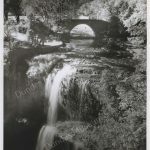 Item consists of a black and white photographic print depicting Webster's Falls.